PHUKET: The CEO of a major construction firm that has been involved more than 40 projects in Phuket amounting to more than B10 billion has flamed government officials for being too slow and using overcomplicated application processes for creating the migrant worker crisis currently evolving across the country. 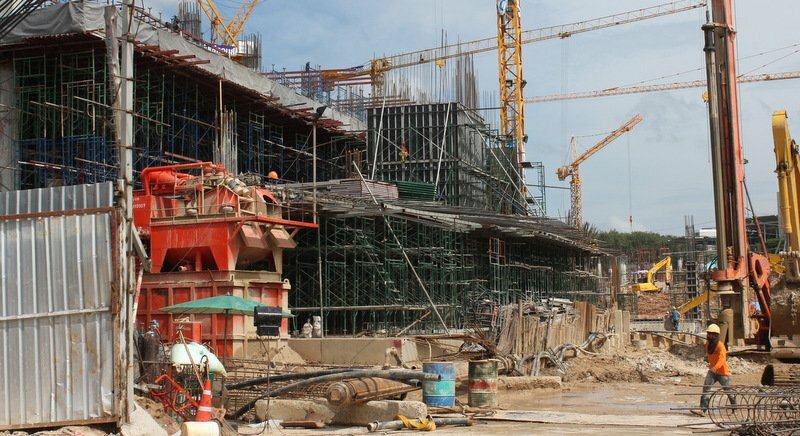 “This is affecting everyone in the construction businesses, but especially the smaller construction firms, as they do not have the human resources to deal with this,” Watchara Jaruariyanon, CEO of Vasi Co Ltd, told The Phuket News. “Complicated official processes and officials working too slowly has led to small construction firms seeking out and hiring illegal migrants for their businesses,” he added. Mr Watchara explained, “Some migrant workers hold temporary worker’s cards called the ‘Pink Card’. Under this system, if migrant workers go to work in a different area, they become illegal. “Officials (in Phuket) used to have a ‘One Stop Service’ for a migrant workers’ registration, but that disappeared two years ago. Surely this is played a part in the lack of migrant worker registrations here,” he added. Mr Watchara called on the government to overhaul the processes for registering migrant workers. “Even after the 180 days clemency (see story here), we need an effective policy that officials can work to,” he said. Mr Watchara first called for a set deadline for officials to complete processing applications as a priority. “Officials by law must have a limited time to finish all process, without delay. If an office is too slow, it costs employers time – and in business, time is money,” he said. “Second, the government must regulate migrant worker agencies, as these agencies play an important role in the business sector,” Mr Watchara said. “Also, the government should standard service prices for these agencies. They should not be allowed to overcharge for their services. This affects businesses and plays a part in the government achieving its goals regarding illegal migrant workers. “Third, we are concerned about the quality of migrant workers available. There should be a standard form for employers to complete when requesting migrant workers from such agencies, and the employer should indicate whether experience is required. That is important. We want migrant workers who have experience for our construction projects.” Mr Watchara added. Meanwhile, Somyos Wongboonyakul, President of the Phuket Fishery Association, told Khao Phuket this morning that Phuket’s fishing fleet had also been hard hit by the migrant worker crackdown. “This has had a direct effect on our industry. Some fishing boats can still go out to work, but others cannot because they don’t have enough workers. It is hard for these boats to work like they used to do,” he said. “I wish the government could see what has happened to us, to see our hearts and that in reality we are not bad men,” he added. 1) unemployment rate in Thailand is extremely low, in April 2017 just 1.2%. Yvonne@ YES YES YES AND YES 100% agree. It would seem that these two employers should listened to. Other than holding things up for more tea money, what reason would there be to delay?